The M3800 is your total media storage and playback solution. Featuring HDMI, component, and AV out, the M3800 can play digital content directly through your existing home theater system. The M3800 supports multiple file formats including WMV9 and VC-1, and even supports 1080P for playback on today's high-definition displays. What's more, with the included remote control, you can enjoy movies, music, photos and more from the comfort of your living room couch. The M3800 is perfect for the home. Its Media Server allows easy connections to DLNA-compatible devices. The iTunes® Server offers music streaming throughout the entire home, while the Photo Web Server enables users to share their precious photos anywhere on the network. With the M3800, the digital lifestyle can be fully realized. Our most advanced home NAS yet. The M3800 is the first of its kind that offers RAID 5, offering a perfect combination of data security and performance. Enjoy the speed of a striped array with the security of complete data redundancy. What could be better? Featuring clean lines and sophisticated styling, the M3800 is equally suited for the study or the living room. It's distinct design makes it an appliance that users will want to show off. 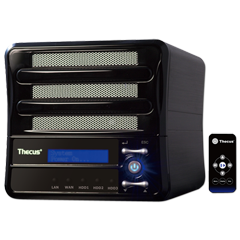 Thecus is known for making things simple, and the M3800 is no exception. With its uniquely-designed disk management system, installing and removing disks is a snap, which means that users can spend more time enjoying their digital media and less time setting things up. The handy LCD panel makes managing the M3800 easy, even in dimly-lit environments like a living room during a movie screening. 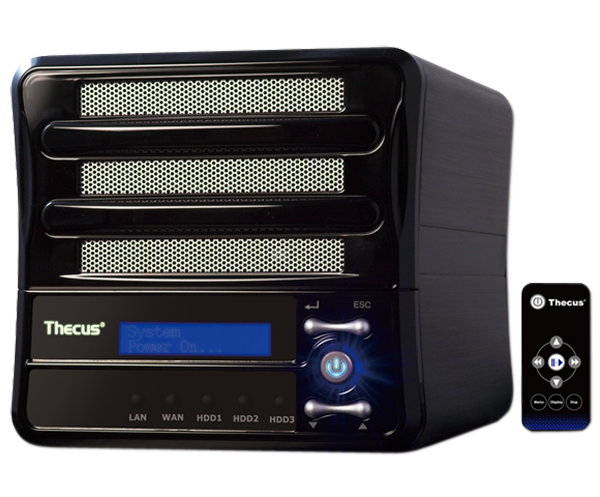 Leading storage solution manufacturer Thecus Technology innovates again! This time, Thecus has worked closely with AMD and now introduces the all-new M3800. Coming this spring, the M3800 features AMD technology and delivers a complete media and storage solution perfect for the home. Based on the AMD Geode™ processor, the M3800's design concept is centered on the home theater. Users can use the M3800 to centrally store, manage, easily access, and enjoy their movie and music files. The whole family can view their favorite blockbuster hits and listen to their favorite tunes without the hassle of having to locate files saved in different locations or multiple machines throughout the house. Headlining the M3800 is its robust media playback capabilities, which include compatibility with the most popular media formats. For video playback, the M3800 supports WMV9, WMVHD and AVI up to a resolution of 1080p. Supported audio formats include WMA and PCM. But the goodness doesn't end there. The M3800 is the currently the only 3-bay NAS device with home theater video and audio sharing functionality. The M3800 supports RAID 5 for excellent data security, and adds wireless capability to allow all users throughout the house to enjoy stored media anytime they please. In addition, the M3800 supports USB webcams, making it easy for users to keep tabs on what's happening in their homes for added peace of mind.